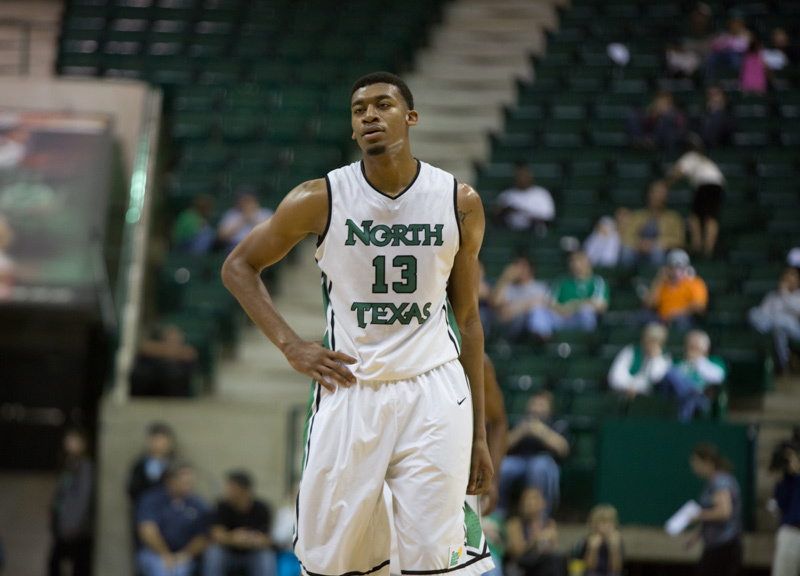 Everyone's Touting North Texas Hoops Star Tony Mitchell. But Is He Worth All The Hype? Tony Mitchell has dunking down to a science. That's only natural. 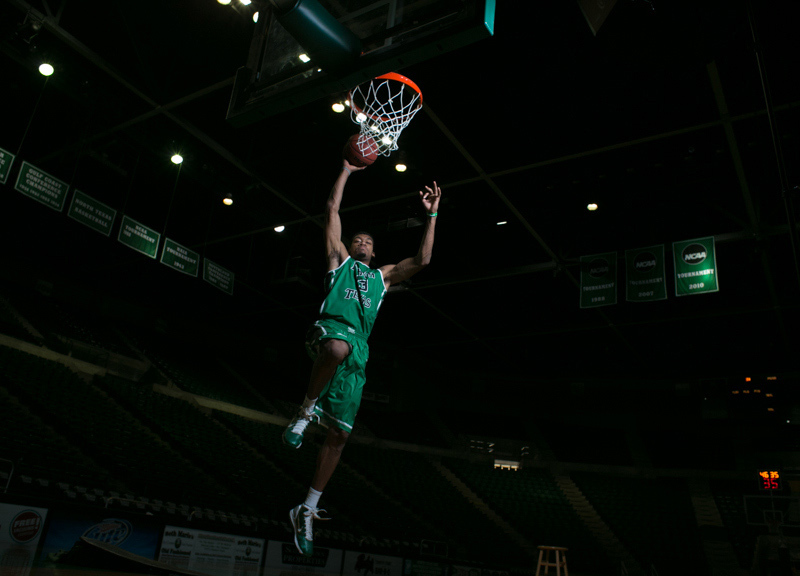 Dunking is, after all, the sophomore University of North Texas basketball star's favorite thing to do. 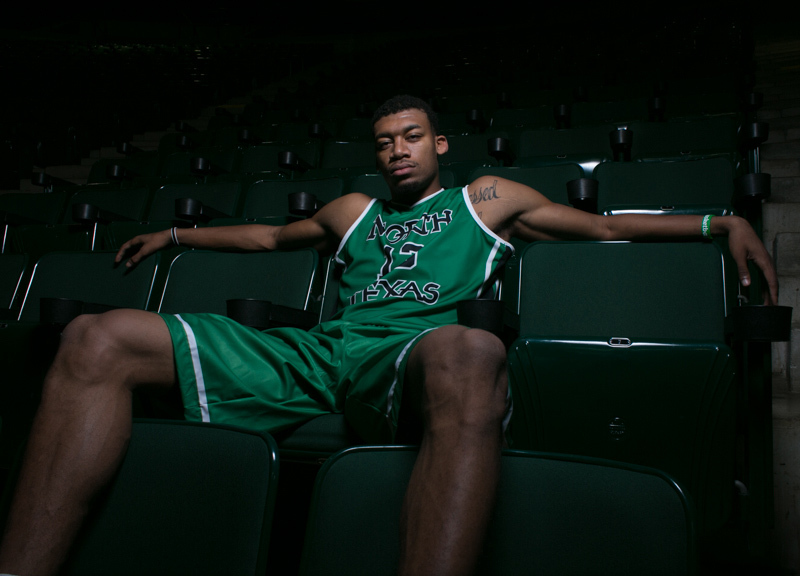 And, over the course of his basketball playing life, it has in many ways become his identity — so much so that tonymitchell13.com, a UNT-built site focused on Mitchell, even offers a step-by-step tutorial of his process. The launch of that website — which is intent on bringing some extra attention to this year's basketball program — came in October, right on the heels of numerous preseason accolades doled upon Mitchell in the wake of his highly successful freshman campaign. CBS Sports ranked the power forward No. 7 on its 2012-13 preseason list of the Top 100 College Players and No. 5 on its 2012-13 preseason Top 50 Big Men list. Sports Illustrated ran a feature on him in their college basketball preview issue, calling him out as one of five student athletes set to place their smaller, nontraditional basketball powerhouse schools on the map this year. ESPN, meanwhile, ranked him as a second team preseason All-American and has had the sophomore ranked as high as fifth on its mock NBA draft board. 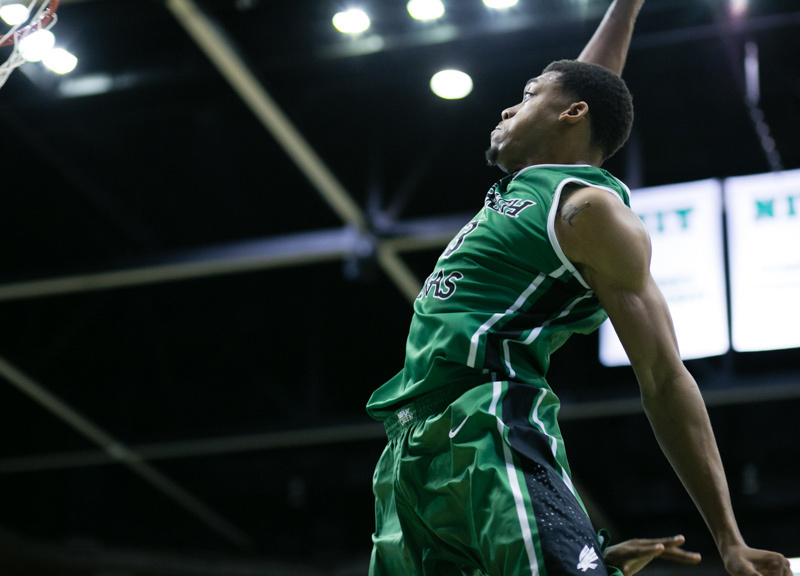 If drafted to go pro, Mitchell would become the first North Texas player to make the league since the '70s. These are significant signs of approval — and a lot to take in, no doubt — but last year's numbers merit this kind of attention for Mitchell. In his first season of college basketball, he averaged 14.7 points, 10.3 rebounds and 2.6 blocks per game. The only other freshman in the country to average a double-double last season was the University of Kentucky's Anthony Davis, whose team won last year's NCAA Championship and who was selected first overall in this year's NBA Draft. Watching Mitchell on the basketball court, it's clear why NBA scouts are similarly drooling over his game. He certainly looks the part of a star pro, standing at 6'8″ with a chiseled 235-pound frame. He has the physical gifts, too, boasting a 41-inch vertical leap and a 7'3″ wingspan. Plus, he's quick like a point guard, which is impressive given his size, and he can shoot like a swingman, knocking down an impressive 47.1 percent of his three-point attempts during his freshman season. Yes, it's obvious why there was a lot of chatter about Tony Mitchell heading into this college basketball season. What's not as obvious — not yet, at least — is whether Mitchell can live up to all that hype. The 20-year-old Mitchell is used to people questioning his future and his promise as an NBA player. For all of the hype he's received in the past few years, he's heard just as much doubt. These days, he's used to it. He largely ignores such slights, choosing instead to focus on all the acclaim. Plus, in his mind, his fate is already sealed. “If I go to the NBA and I get in the dunk contest, Iâ€™m gonna win,” Mitchell says. There's a palpable pride in this claim. More prominent, though, is the nonchalance with which it's delivered and the certainty behind it. Far as Mitchell is concerned, a career in the NBA is an inevitability. 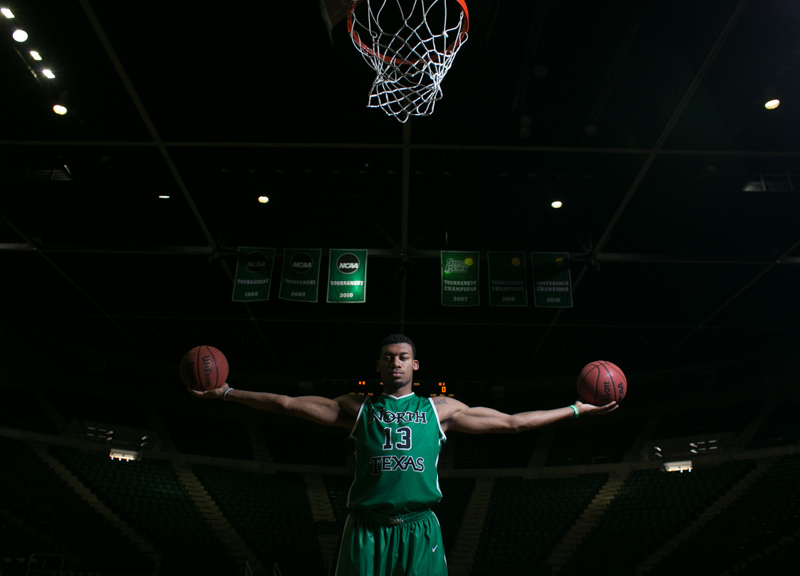 And yet, for a moment, during his team's contest against Jackson State this past Saturday night at the UNT Coliseum (known to most as The Super Pit), all of this — the promise, the potential, the NBA future — appears in jeopardy. 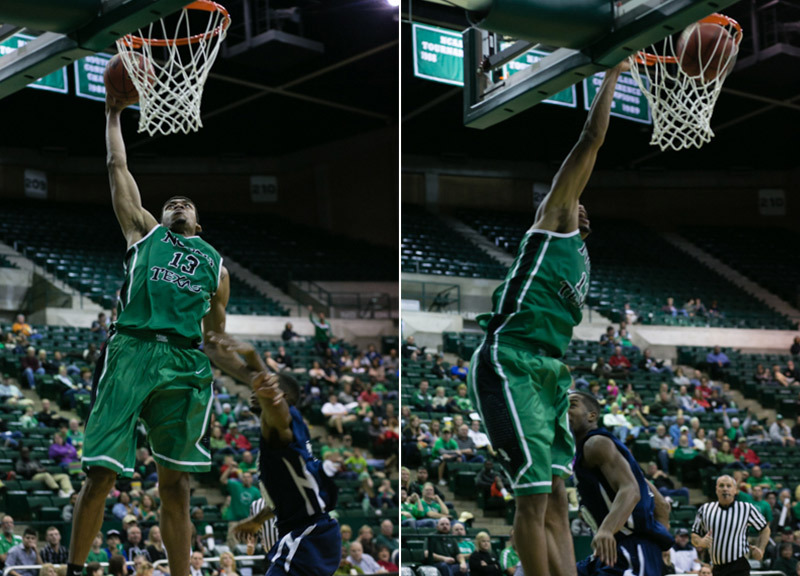 Mitchell's tried-and-true dunking method — the very same one touted on that UNT site — is thrown. Specifically, it's thrown by Jackson State sophomore forward Syndey Coleman. It's early in the second half of the game — pretty much a must-win one for the heavily Mitchell-dependent, 3-6 North Texas squad — and Mitchell finds himself with the ball in his hands. The court in front of him is open. The opportunity for yet another highlight reel-ready dunk looms. Racing up the court with his eyes locked on the basket, Mitchell prepares for his takeoff. Coleman closely trails behind. Nearing his basket and passing the free throw line, Mitchell begins his ascent. It's a fairly run-of-the-mill offering from Mitchell — a standard, one-handed Tomahawk slam — but it's a flashy move nonetheless. He finishes the move with authority, just as he always does. But something else happens, too. His momentum is shifted mid-air by Coleman, who catches Mitchell and grabs him just as the ball goes through the basket. No foul is called on the play, but plenty of damage is done. Just below the baseline, Mitchell lands with too much weight falling unexpectedly on his right ankle. He tumbles down to the ground. In an instant, the Super Pit crowd of nearly 3,000 goes from wildly cheering and celebrating the dunk to an eerie, sustained silence. Mitchell is writhing in pain. His groans are the sole sounds filling the arena. Within moments, his mother, his father, his head coach, his teamâ€™s trainers and his teammates all gather by his side. Just as it had been a few year's earlier, Mitchell's seemingly certain future of a career in the NBA lies in an awkward public, limbo. Mitchell's athleticism and skill sets have always been advanced, his place among the most talented basketball players of his age in the country a given. 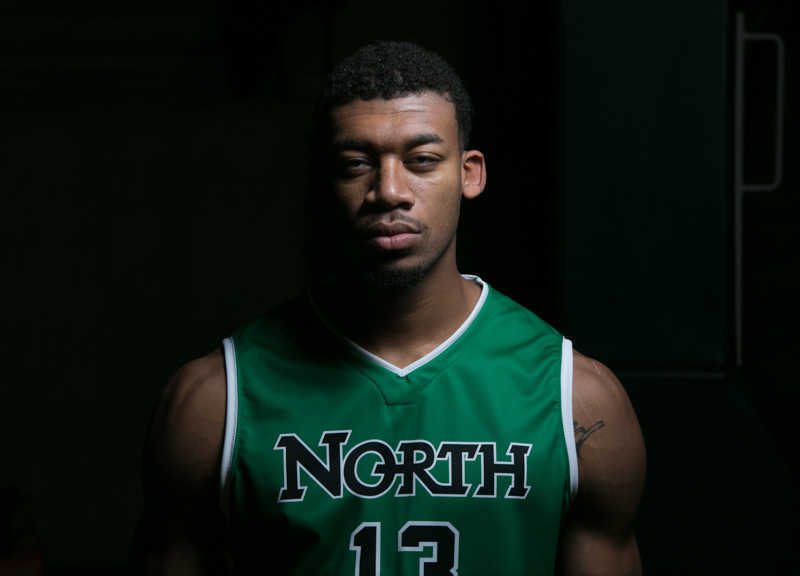 By his senior year of high school, Mitchell had received scholarship offers from such esteemed college basketball programs as Missouri, Georgetown, Marquette, Baylor, Cincinnati, Kentucky and Oklahoma. He even, for but a brief moment before his junior season, verbally committed early to accepting a basketball scholarship at Kansas State University. His grades were an issue, though. They always were. In 2008, perhaps in effort to circumvent those academic concerns, Mitchell transferred to a private and basketball-centric Miami, Florida, prep school called the Center of Life Academy. For whatever reason, the school wasnâ€™t a great fit; by his senior year, Mitchell had returned home to Dallas' L.G. Pinkston High School. Back in Dallas, the accolades thrown his way continued to come — in 2009, Mitchell was considered the top high school prospect in the city and one of the top big men in the country, according to Rivals.com — but an issue stemming from his time at Center of Life Academy started taking center court in the discussions surrounding Mitchell. The Dallas Independent School District refused to accept the credit hours Mitchell had completed at the Center of Life Academy, an unaccredited high school. And, instead, they set Mitchell back a full semester in his academic studies. The issue only grew from here. A joint investigation from WFAA-TV and The Dallas Morning News revealed that Pinkston had issued Mitchell the equivalent nine make-up exams in a two-day span so that he could make up his 14 nontransferable credits and graduate with his class on time and in accord with his plans to eventually attend college — now the University of Missouri — the following fall. Over the summer and in the weeks following that investigative report, Mitchell would finally resolve his academic issues, but his fate as far as Mizzou had been sealed: The WFAA/DMN report led the NCAA to rule Mitchell as academically ineligible, forcing him to sit out of basketball activities for the fall 2010 season. Unsurprisingly, Missouri's interest in Mitchell then waned. But Mitchell's dreams of playing NCAA basketball — and, one day, NBA basketball — didn't. Lucky for him, Mitchell had another option. Before committing to Missouri, the University of North Texas had, almost shockingly, figured prominently into his recruiting mix. The school was the clear outlier among the other programs recruiting him, not nearly the national powerhouse that the others were. 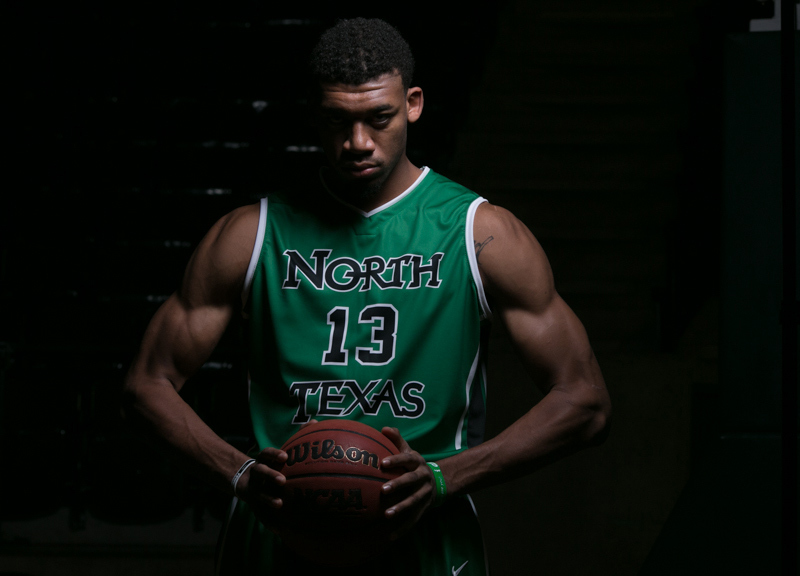 But after the NCAA ruling against him, the Mean Green proved the most attractive option. As a part of the Sun Belt Conference, the university could offer him academic non-qualifier status and bring him aboard their team roster later. 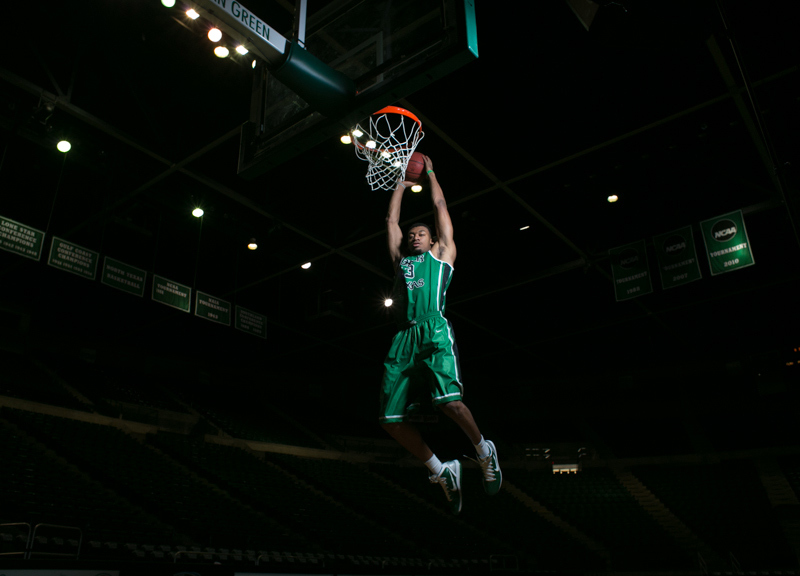 And so, in the spring of 2011, Mitchell enrolled at UNT without an athletic scholarship. For a year, he was unable to train or practice with the team until he was in good academic standing with the NCAA. 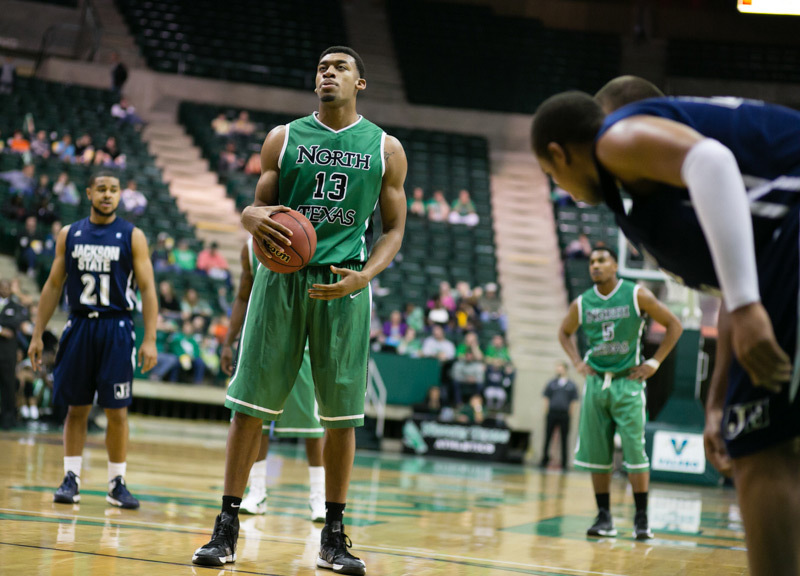 One-on-one training sessions with the strength coach were the closest Mitchell came to UNT basketball that year. For UNT, the move made perfect sense. For Mitchell, it meant his window remained open, albeit now a ways down the road. So he waited. While doing so, he spent his basketball days in the university's Pohl Recreation Center, playing pick-up games and competing in intramurals, flashing his ever-present potential on a much-smaller scale than he ever anticipated. But even in this recreational setting, he shined. The adoration that had always followed his play continued. Students would gather to watch his rec center games, gawking at the freak athlete casually dunking with friends and nonchalantly hitting spot-up threes. 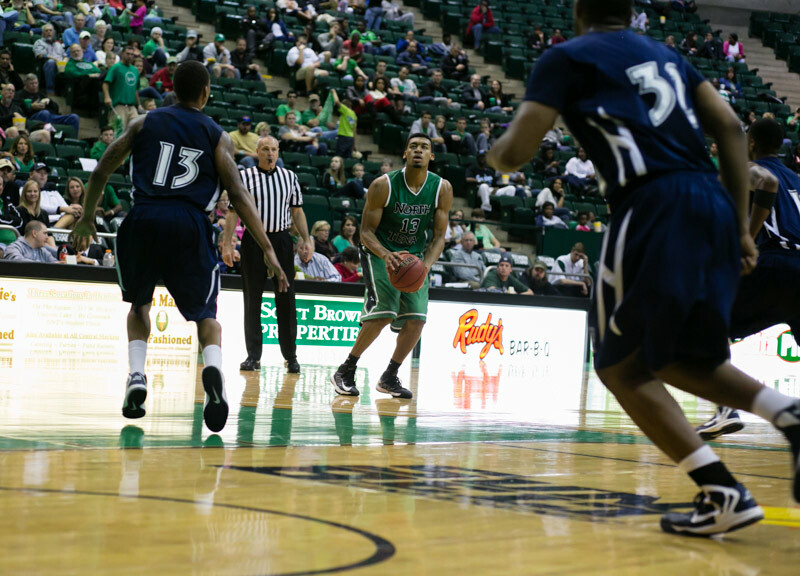 Finally, after completing the necessary 24 credit hours of class needed to regain his eligibility, Mitchell was able to join the Mean Green roster in mid-December of last year. To say Mitchell made the most of this early opportunity would be an understatement. Despite playing in just 23 games that first season in green, he earned both Sun Belt Conference Freshman of the Year and First-Team All-SBC honors while setting the North Texas single-season blocks record (70) and leading the Mean Green to the Sun Belt Conference Championship. 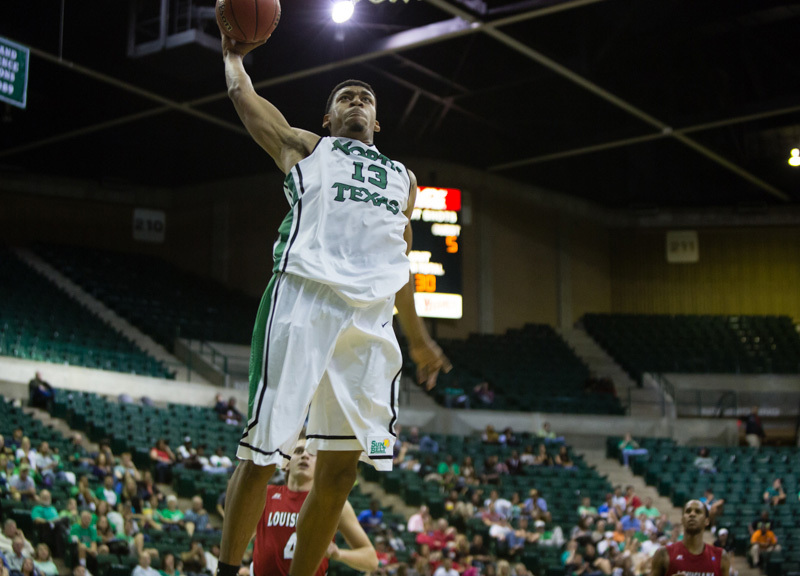 After Mitchell announced that he would return for his sophomore year at UNT, the national attention finally returned. On October 23, a UNT -endorsed preseason media appearance forces Mitchell to be late to a pre-practice weight room session. There's no scolding for his late arrival, though. Nothing serious, anyway. As Mitchell walks into the locker room, sports information director Stephen Howard chides Mitchell some — but only about his latest accolade. “CBS just ranked you No. 5 on its Top Big Men list,” Howard says, holding a print-out of that very, just-published list in Mitchell's direction. Mitchell doesn't even bother looking at it. 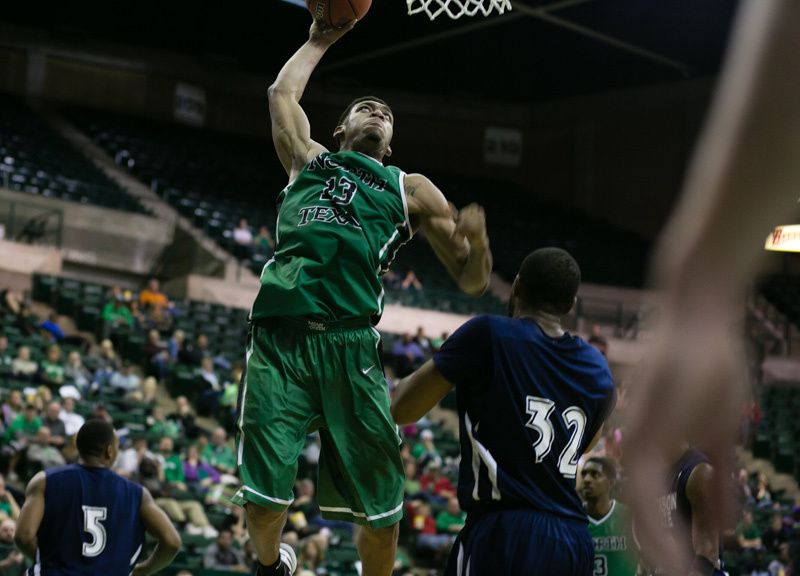 All year long, there has been a palpable buzz on UNT's campus about this year's basketball program. On Monday, October 15, that excitement came to its head. On this night, UNT brought back an event the campus hadn't seen since the '90s. Midnight Madness, a regular occurrence at some of the nation's biggest basketball programs, offers fans their first chance of the season to look at a given year's team. 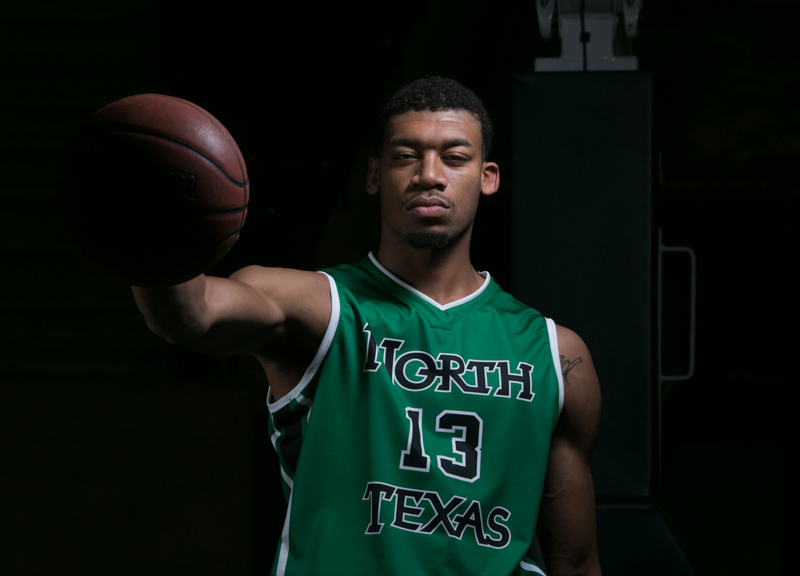 This year's UNT model featured a scrimmage, a three-point contest and a dunk contest intended to spotlight Mitchell's abilities. Standing under the Midnight Madness spotlight, Mitchell looks every bit like the talent he's supposed to be. He looks determined, too. Standing at half-court, Mitchell, despite the mayhem surrounding him — particularly, the close proximity of fans cheering Mitchell on from the sidelines and taking pictures of the player in his white, untucked practice jersey and green practice shorts — is fully focused. His eyes are locked on his teammate, freshman guard P.J. Hardwick. He stands with his shoulders slumped slightly forward. His right foot is crossed over his left, tapping the ground. He's calculating. Finally ready, he takes off like a sprinter toward the basket. Five long strides later, Hardwick tosses Mitchell the ball — an alley-oop — as Mitchell plants his feet in the ground and launches into the air. His arms are fully extended above his head. By the time he catches up to the pass, his hands have extended a full foot past the rim. Mid-air, with his head at rim-level, he pulls the ball down below his waist, all while maintaining the full extension of his arms. He maneuvers the ball in a counter-clockwise, windmill motion. To really add style points to the dunk, Mitchell also spins his body. It all happens in an instant, this powerful dunk, and it ends with Mitchell latching onto the hoop, his back to the basket and his eyes still locked on the rim. After he lands, Mitchell calmly walks away from the basket. His eyes look at the ground. Again, his shoulders slump slightly forward. Hardwick runs up alongside him, cheering the effort. Mitchell only acknowledges his presence with a low-five. To Mitchell, the dunk is not big deal. Nothing worth celebrating. In fact, if anything, Mitchell is a little tired. The three-hour practice the team held before this event wore out his legs, he later admits. Still, he had to wow the crowd. It's what they've come to expect from him. Mitchell's hopes for his sophomore season are high. His goals include a 24-win season, a Sun Belt Conference championship and making a run in the NCAA tournament. Early on this season, those seem like distant dreams. 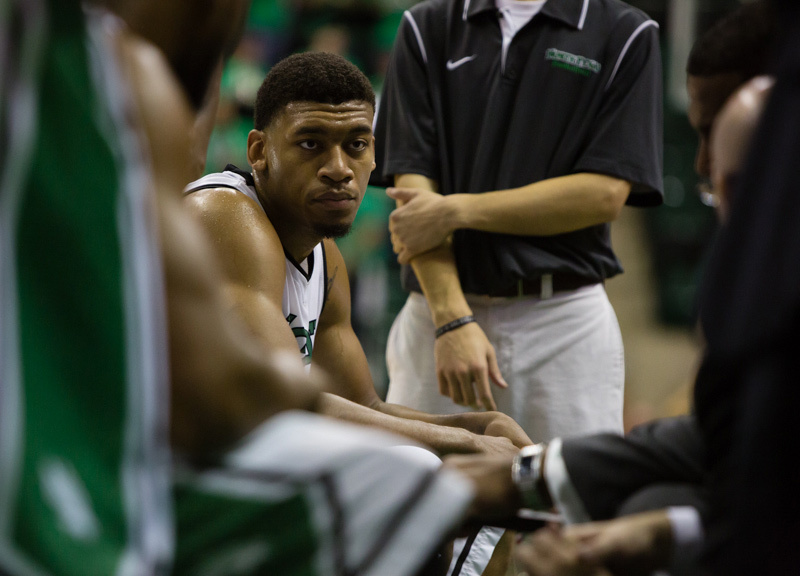 Through 10 games this season, Mitchell and the Mean Green are two games under .500. They've looked their worst in their most high-profile settings, too. In the first game of their highly-anticipated season, Mitchell and the Mean Green faced Doug McDermott, the player ranked second in that CBS Sports Top 50 Big Men list, and his No. 16-ranked Creighton University Bluejays. Mitchell registered 18 points, 7 rebounds and 2 blocks in that effort, but it wasn't enough; his team lost that game 71-51. 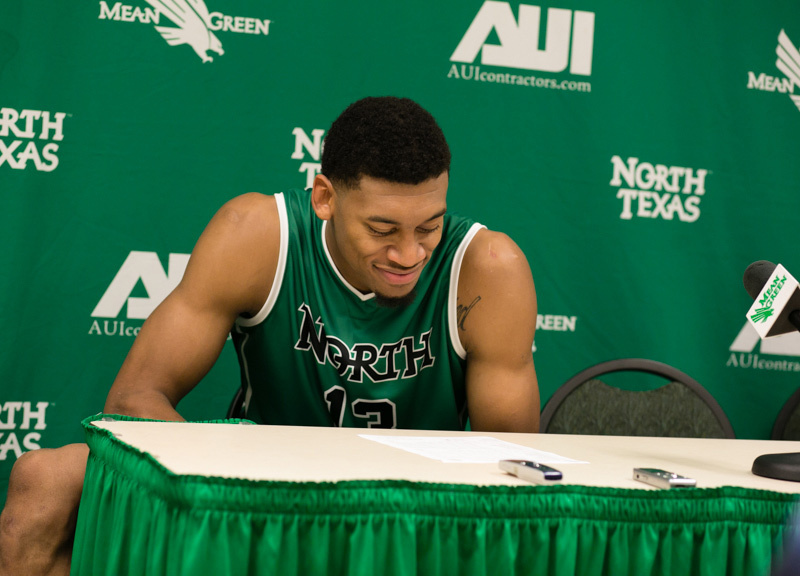 And that's been the story of the season thus far: Though Mitchell has flashed the play and athleticism of his freshman campaign and even put up similar stats while doing so, the losses keep piling up for North Texas. There is, of course, palpable pressure. And not just on Mitchell. 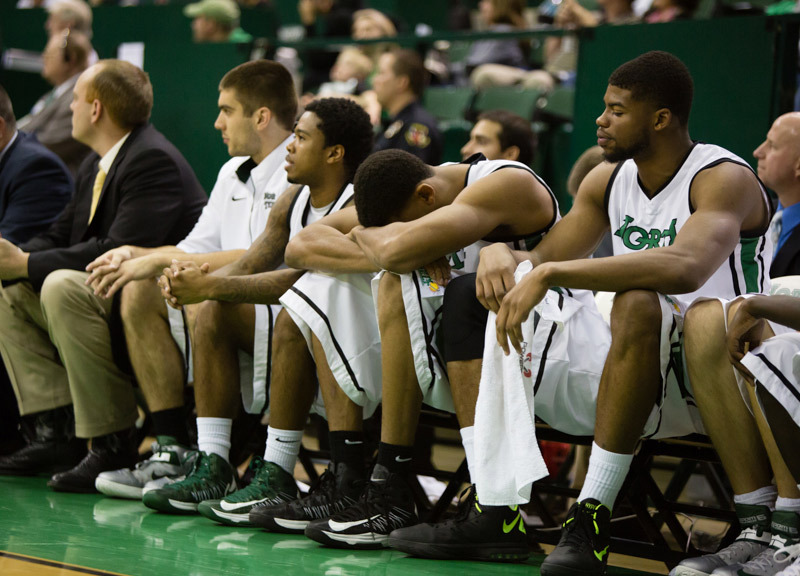 This season is UNT's last season in the Sun Belt Conference. Next season they'll join Conference USA, a higher-profile athletic conference than the Sun Belt. Clearly, the team wants to move on with a high note. 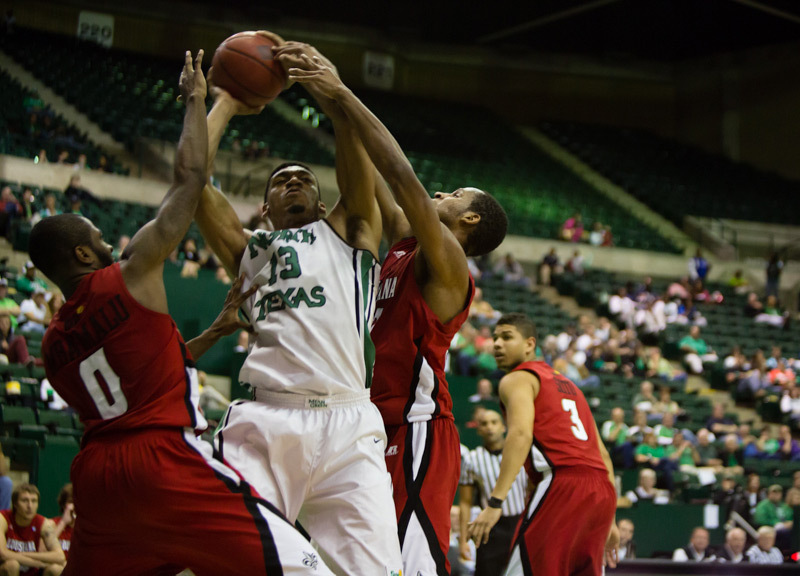 But, in their conference opener on December 1 against Louisiana-Lafayette , the Mean Green again looked overmatched. And so, too, did Mitchell. In the 80-76 loss, Mitchell scored just three points and fouled out with two minutes left in the game. 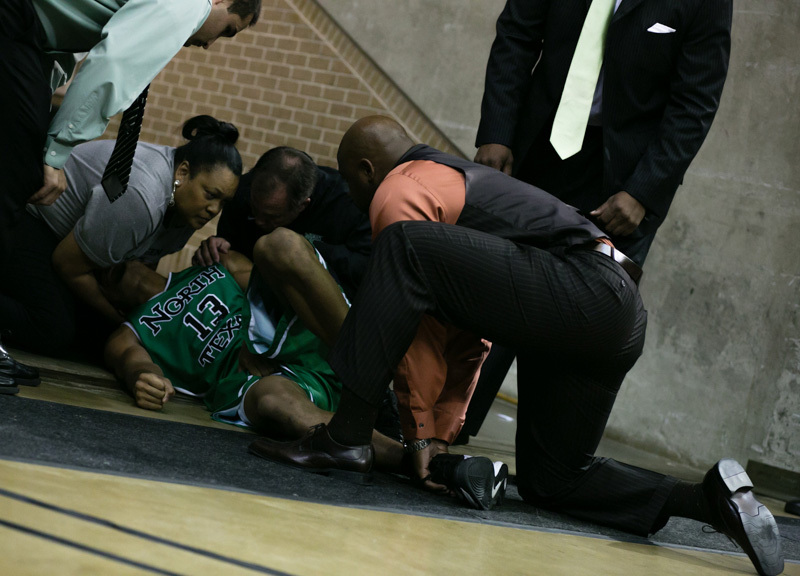 Mean Green head coach Tony Benford was visibly frustrated with Mitchell's play after the game, dropping his head and shaking it at the mention of the supposed All-American's name during the post-game press conference. Mitchell's lone shot attempt throughout that conference opener was a fast-break dunk. It was a typically flashy, powerful Mitchell dunk, sure. But, when Benford is expecting 15 to 18 shots a night from Mitchell, one flashy dunk isn't nearly enough. Mitchell bounced back well enough in the team's following game at the University of St. Louis, contributing 18 points and 8 rebounds. But the team would lose this contest, too. It would be their fourth loss in a row. In other words: They've got to live up to all that preseason hype. More specifically, so does he. The Jackson State game seemed like as good a time as any to start doing so. And, early in the game, Mitchell lives up to his end of that deal. He calls for the ball near the baseline. After catching a pass, he's one on one with a Jackson State defender. He dribbles once, shimmies some and takes off toward the basket, posterizing his opponent in the process. Like they always do after a Mitchell dunk, the crowd erupts. Mitchell, feeling the moment too, proudly flexes his muscles in celebration. He's playing well. So is his team. There's a sense of purpose in their play — the exact thing Benford had been publicly begging to see from his team. And yet, despite the hard play by Mitchell and his teammates, at the end of the first half, North Texas still trails by a point. On the ground in the wake of his breakaway dunk — a basket that brings his slumping team to within four points of Jackson State — Mitchell is in obvious pain, agonizing away. He tells the small crowd gathered around him that he thinks he's broken his ankle. With assistance from his team's trainers, he's helped off the ground and hobbles off toward the locker room. Play continues while Mitchell is cared for. And, in his absence, his team actually thrives. They erase the four-point gap. Before long, they've even takes a two-point lead. Better yet, minutes after hobbling to the locker room, Mitchell is no longer in pain. He runs out of the Super Pit tunnel and onto the court with 14 minutes remaining in the game. His ankle isn't broken, turns out. It's not even sprained. He's greeted by cheers from his always faithful fanbase. And, once again, he plays well. So, too, do his teammates. Together, their collective play dominates the game's remaining minutes. By the time the final buzzer blows, the game has long been out of reach. The final score? 83-65. Mitchell played at the dominant level he's always been expected to, finishing with 15 points, 11 rebounds and 2 blocks. After the game, his coach goes out of his way to praise his effort. The dream season seems saved for now. And, just like that, the teamâ€™s lofty goals no longer seem so distant. A 4-6 record is infinitely better than a 3-7 one. Once again, the hype surrounding Mitchell seems justified. And Mitchell, for one, still believes all that hype, all that talk, all that chatter. He flashes a smile and acknowledges that it's a question he's heard a lot of — perhaps too much of — in recent weeks. But after a game like this, a high note like this, it seems like a stupid question. And he treats it as such, tilting his head accusingly in the direction of it. James Coreas contributed to the photos in this piece.